Much of Stirling Castle stands as a monument to the power and status of James IV, proclaiming him to be a European monarch of great standing. The king carried out more building work here than in any other royal castle. This was his crowning glory. Today's Castle was shaped principally by James who established Stirling as a glittering centre for the brilliant court he gathered around him. Below the castle’s battlements, James staged tournaments that showed his warlike prowess and chivalric qualities. Within its walls, renowned poets, musicians and even an alchemist made the king’s court one of the most culturally accomplished in Europe. The impressive Forework with its central gatehouse was built around 1500 but what visitors see today is only a shadow of a more dazzling processional entrance built to impress the rest of Europe. The gatehouse had two great three quarter-round towers and to either side was a pair of half-round drum towers and at the ends of the Forework two rectangular towers. If we look left we can still see one of the rectangular towers, the Prince's Tower, standing to its full height. Sadly the gatehouse itself and the Elphinstone Tower on the far right were greatly reduced in height in 1689 to create a gun platform as the Jacobite rising against the new Protestant monarchy of William and Mary gathered menace. From the Outer Close we climb the steep cobbled road between the Palace and the Great Hall of the Castle into the Inner Close or Great Square, created by James IV, around which the principal royal buildings of the Castle were grouped. This is the castle’s glory – the recently restored Great Hall. Designed about 1500 it was the largest ever built in Scotland and was intended for grand celebrations and state occasions. During its restoration from a grim soldiers' barracks the great hammer-beam roof and its exterior wall-walk were reinstated and the walls rendered and lime-washed in the traditional Scottish manner so that visitors can be whisked back through the centuries to see the building as its designers intended. Inside the vast hall we find a towering space with a raised dais at one end for the high table where the King once sat and above the wide fireplace on the east wall an elaborately embroidered Cloth of Estate carrying the Royal Arms of James IV. This spectacular piece of craftsmanship, unveiled by Her Majesty the Queen in 1999, took two years and the work of seven dedicated volunteers to create. Looking up, we can see that most of the windows are fairly small and set high in the walls above the hangings but around the dais they are full length and contain roundels bearing the coats of arms of the most powerful of Scotland's nobles at King James’s Court. The windows on either side of the Cloth of Estate carry the arms of James IV, his Queen - Margaret Tudor Henry VIII's sister - and his mother, Queen Margaret of Denmark. James may have wanted to be buried next to his father in nearby Cambuskenneth Abbey but his tomb remained empty. In the aftermath of Flodden, James’s body remained in England. 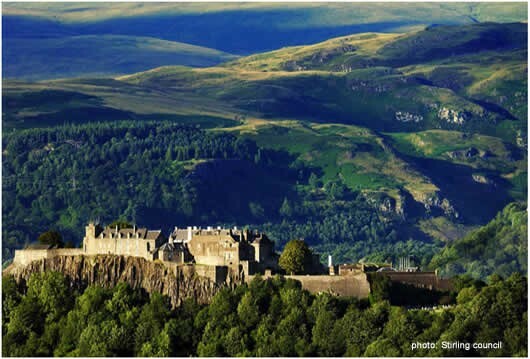 The surviving nobles rallied to Stirling to reorganise the kingdom’s government and less than a fortnight after his father’s death, James V was crowned here, aged just one year old. 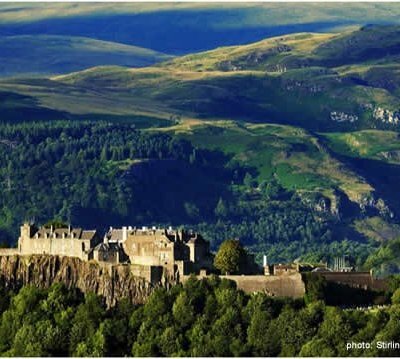 Stirling Castle is situated in the centre of Stirling and is well connected by road and rail to Glasgow and Edinburgh. If travelling by car simply head towards the town centre and follow the signs to the castle.